It’s got to be the single most famous baseball play in which a hitter didn’t take the bat off his shoulder. 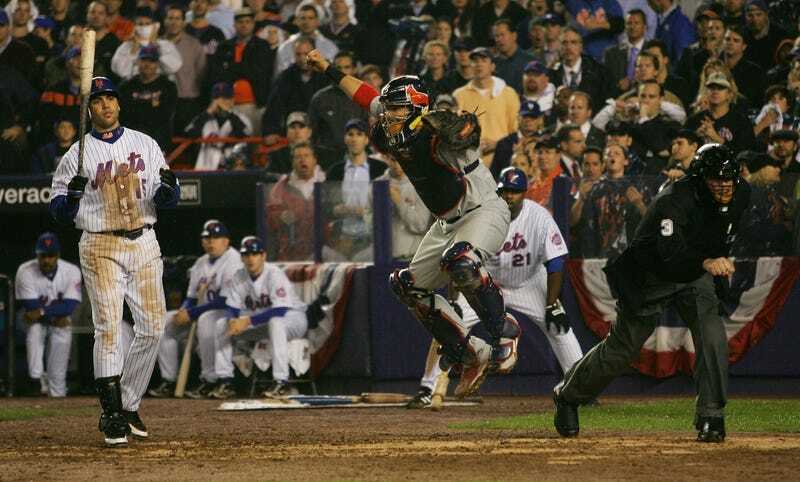 Oct. 19, 2006, bottom of the ninth, two outs, bases loaded, the Cardinals clinging to a two-run lead in Game 7 of the NLCS, and the Mets’ most feared hitter at the plate. Baseball drama doesn’t get much higher, and even more rarely in the great moments of baseball past is “paralyze” the operative verb. Jeff Suppan and Oliver Perez both pitched beauties, but the Cardinals got to Aaron Heilman in the top of of the ninth on a two-run homer from Yadier Molina, then just a 24-year-old defensive catcher derided for his bat. In the bottom of the ninth, the Mets scratched a pair of singles against rookie Adam Wainwright, who had served as a reliever despite only ever pitching as a starter in his minor-league career, and had been pressed into closing duties by an injury to Jason Isringhausen. Wainwright got a pair of outs, then walked Paul Lo Duca to load the bases for Beltran, who had hit a career-high 41 home runs that year, plus another three in the NLCS. You remember exactly how that at-bat went. It’d have looked just as bad to whiff on a wasted pitch designed just to see if he’d bite, something any hitter would expect in an 0-2 hole. But Beltran simply didn’t believe that pitch, going where it looked for all the world like it was going, could drop back into the zone. He was well and truly fooled. Today the St. Louis Post-Dispatch’s Derrick Goold has an appreciation of that fateful night, specifically that curveball. A brutal out pitch for a closer, it would prove diabolical enough to serve Wainwright well in a long and successful career as a starter—FanGraphs says it’s been the most effective curve in MLB since 2006, despite often ending up over the meaty part of the plate. Goold notes that Wainwright might never have even thrown a curve if not for the Braves, who drafted him 29th overall in 2000. All the way through high school, Wainwright’s breaking ball was a slider, with a little more speed and a little less drop. After signing Wainwright, then-Atlanta executive Dayton Moore took him aside and told him to work on a curveball, which the Braves liked to see mastered by all their pitching prospects, especially a tall righty like Wainwright. Atlanta built a division dynasty out of an ability to identify and unleash elite pitching. Moore explained how the organization’s philosophy preferred a curve to sliders for young pitchers. A slider would too often veer into the power zone for a lefthanded batter. Better to have a curve plummet. Best to have one like Wainwright. In a 2011 oral history to mark the five-year anniversary of the game, Wainwright recalls it as a low-risk, high-reward pitch, the worst case scenario being a ball outside and the count still in his favor. We all know now what Wainwright and Beltran knew in that moment—it was unhittable—but in the stands, in the very last playoff game ever at Shea Stadium, all they knew was that the Mets were an extra-base hit away from the World Series, and went home without Beltran even taking a whack at it. It still stings. With years to reflect, Beltran acknowledged in 2012 that he never had a chance on that pitch, and even if he had flailed at it, the ultimate outcome would have been the same. It’s not so clear-cut as all this, but the moment accurately reflected the immediate futures of the two teams. The 97-win Mets wouldn’t make the playoffs again until 2015. The Cardinals, despite 2006 still representing their second-lowest regular-season win total of the century, finally broke through to win a World Series. Beltran has a decent case for Cooperstown, though it still feels like a long shot. Wainwright has been a Cardinal for life, though he missed their entire 2011 championship season after Tommy John surgery. His curve remains his out pitch.